The shard above doesn’t look like much. It comes from a specimen far too large for us to excavate, let alone pack onto a plane for the trip home. Here’s a view of one of the full specimens still in bedrock. And here we see a liberated specimen with Katherine Nicholson Marenco (’03) for scale 12 years ago. This is the ammonite Titanites anguiformis Wimbledon and Cope, 1978, from the Portland Freestone (anguiformis Zone, Portlandian, Upper Jurassic) exposed on the Isle of Portland in Dorset, southern England. Katherine and I, with help from Rich Poole (’03), Clive Griffiths, Tim Palmer and Paul Taylor, worked there in the summer of 2002 looking at encrusting faunas on shells for her Independent Study project. We could only take bits home, hence the fragment above. It was a wonderful field season in a spectacular place. 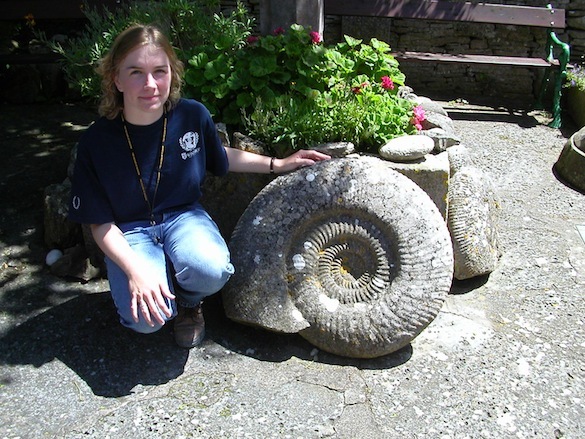 Titanites anguiformis is one of the largest ammonites, with specimens up to a meter in diameter. Our specimens above are all molds made of limestone; the aragonitic shells dissolved away. These lumbering beasts were swimming predators like all ammonoids, feasting on a variety of invertebrates in a shallow Jurassic sea. 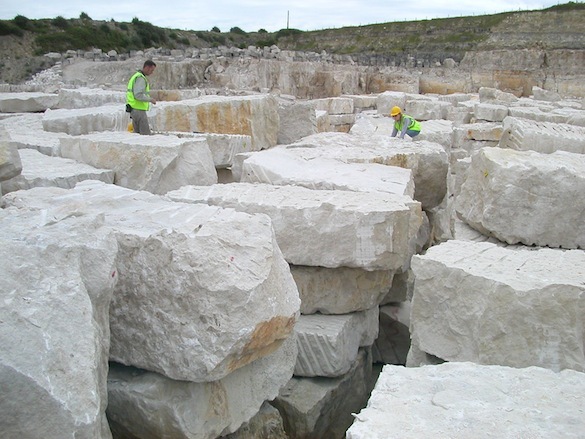 Our team spent most of its time in active building stone quarries like this one (Coombefield) looking at excavated blocks of Portland Freestone. This rock is one of the most comon building stones in England. The many surfaces of the blocks exposed fossils in a variety of orientations. 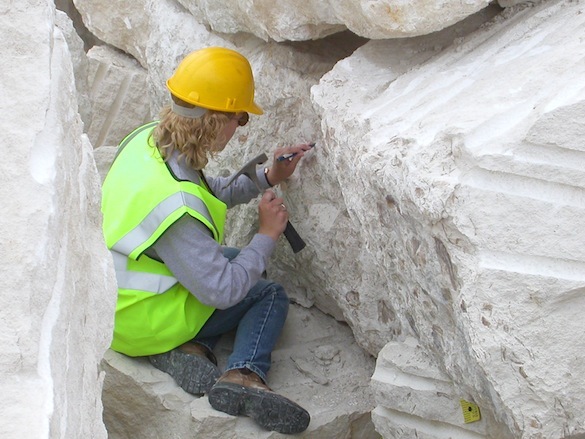 Here is Katherine doing what she did for three weeks: chiseling bits of shell from the limestone. Our goal was to collect surfaces like this. We have here an internal mold of Titanites anguiformis. 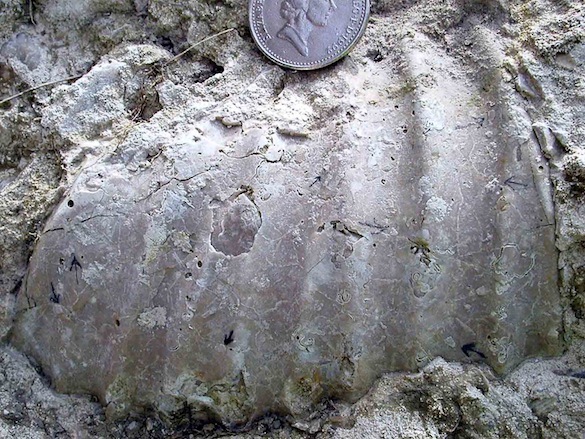 The inner surface of the shell (a cryptic space) was encrusted by bryozoans, serpulid worms and oysters. 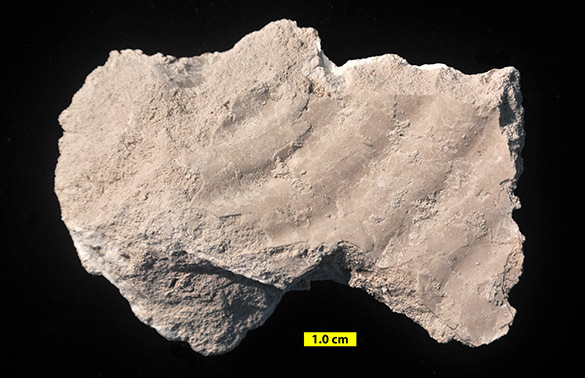 When the aragonitic shell dissolved, the undersides of the encrusters were exposed like we see here. We then studied the attachment surfaces of the encrusters, looking at their growth patterns and successional overgrowths. Katherine’s work resulted in this GSA presentation. This fossil bit is thus a reminder of a great field season on the coast of southern England many years ago. Falcon‐Lang, H. 2011. 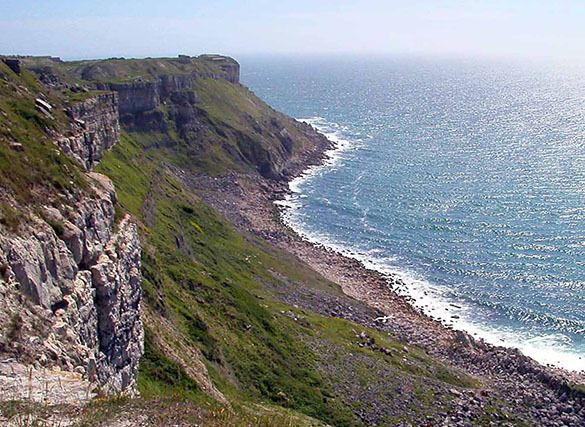 The Isle of Portland, Dorset, England. Geology Today 27: 34-38. Wimbledon, W.A. and Cope, J.C.W. 1978. 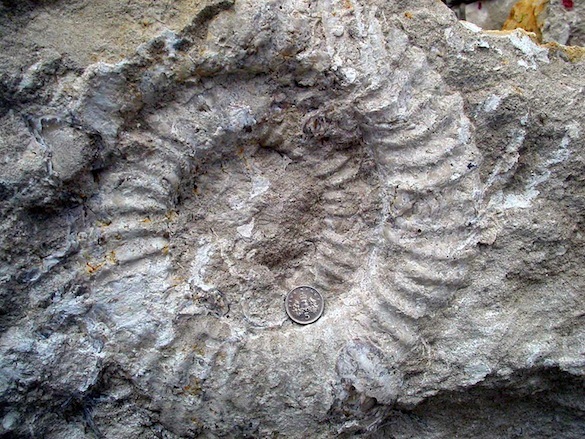 The ammonite faunas of the English Portland Beds and the zones of the Portlandian Stage. Journal of the Geological Society of London 135: 183-190.